Join us downtown from 5 - 8 pm on Main Street for an evening out. Date Night! Drinks with Friends! Music! Main Street will be closed from 5 - 8 pm so that you can enjoy our beautiful downtown. Shop | Get a drink at our outdoor bar | Reserve your child's spot at our first ever KIDS NIGHT OUT! Kids Night Out is a RESERVATION ONLY childcare option for parents coming downtown for Summer on Main. 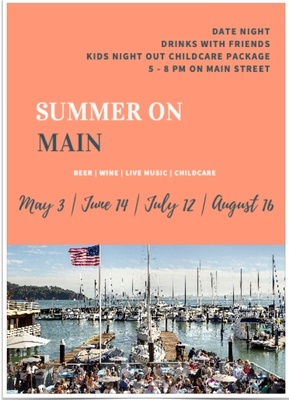 The Tiburon Peninsula Chamber of Commerce in partnership with Rent-A-Parent provides for your child dinner, movie and entertainment from 5 - 8pm at a local downtown restaurant. Space is limited! Don't wait to reserve your child's spot! Summer on Main will NOT offer outside table service.